The Honda Accord is big business. For 29 out of the last 30 years, Honda has sold between roughly 300,000 and 400,000 new Accords here in the United States. Figure an average transaction price in the ballpark of $30,000 these days, and that means Americans are spending in the range of $10 billion per year on brand-new Accords. They're the reliable workhorse for millions of households across the land, vehicular appliances that serve as the backbone of many peoples' mobility needs. But they're part of a breed that seems to be dying off. Honda does indeed rake in piles of cash every year from its mid-sized sedan, but like most carmakers, more and more of the company's income is coming from the sales of sport-utility vehicles as Americans move en masse to crossovers, pickup trucks, and other jacked-up family haulers. In 2016, the carmaker moved 345,225 Accords, in contrast to 357,335 similarly-priced CR-Vs.
That said...345,000 cars sold isn't exactly bad news. Honda hasn't given up on the sedan class yet. And as long as yearly Accord sales are worth, say, a decent-sized chunk of the U.S. Army's annual budget, the company likely never will. So for the 2018 model year, the carmaker has rolled out an all-new 10th-generation version of the car that played a leading role in the company's rise to prominence in America, complete with a fresh design, an all-four-cylinder selection of powertrains, and a simplified model lineup that kisses the coupe goodbye. (On the bright side, however, the manual gearbox sticks around, and can be specced with either engine.) And to show the car off to its all-important American audience, Honda invited The Drive (and a bevy of other media outlets) to the foot of Mount Washington to cut loose on the winding roads of the White Mountains, where we could push the car...well, if not to its limits, then at least far closer to it than most owners ever will. The 2018 Accord, sadly, can’t quite match the best of them. The squared-off, partially black-out snout pairs poorly with the low, sleek lines of the rest of the car; it brings to mind nothing so much as a right whale opening up for a big bite of krill, especially in models painted bright, light, or contrasting colors. It’s no fatal flaw, but it is a little sad to see—especially considering the old Accord was a handsome ride throughout its entire life. Hard to miss that schnozz. Look past the blocky, pedestrian impact-friendly nose, though, and the design starts to improve. Thanks to tweaks like a minor (14 mm) lowering of the roofline, the car looks longer than it is—and at 192.1 inches, it’s already a long car. Said roofline flows into the trunk with a fastback’s grace; like the 10th-generation Civic it shares much of its platform with, you’d be forgiven for assuming at first glance that the rear glass rises and falls when you open the lid. The flowing character lines that run down the car’s flanks ties the whole look together, with a belt line that rises and falls like a bunny ski slope and a pinch of flared sheetmetal near the bottom that pays a subtle homage to either the classic Coke bottle or the Convair F-102, depending on where your personal preferences lie. The new Accord's strongest lines lie in its aft half. But inside is where the people who buy Accords will be looking at the car the most, and that’s where this Honda’s design really shines. The interior designers must have thought about the E-Class and A4’s insides until they dreamed in German, and the effort paid off in spades; the new Honda captures much of the best of those cars and simplified it down, weeding out much of the complexity and over-complication. The dashboard blends an analog speedometer on the right with a reconfigurable, TFT screen tachometer on the left. 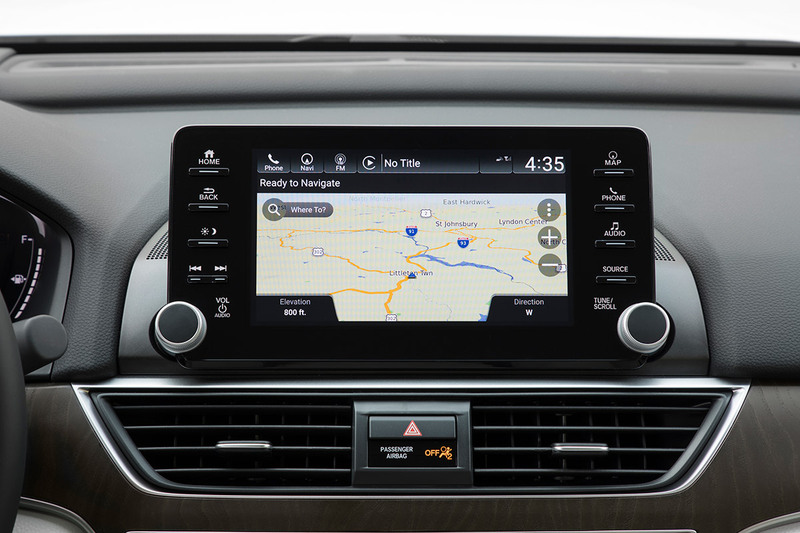 Unlike some, however (cough cough, BMW, cough cough), you can’t tell where the screen ends and the real-life gauges begin; it looks like one seamless display. The in-tach menus are easy to navigate, all rendered in simple, high-contrast colors and controlled with a left-thumb click wheel on the steering wheel. A clean interior layout...complete with a stick. It still looks a little tacked-on sitting on the edge of the dash, however, as all such systems do. But maybe I’m just getting used to them, as it doesn’t bother me that much. 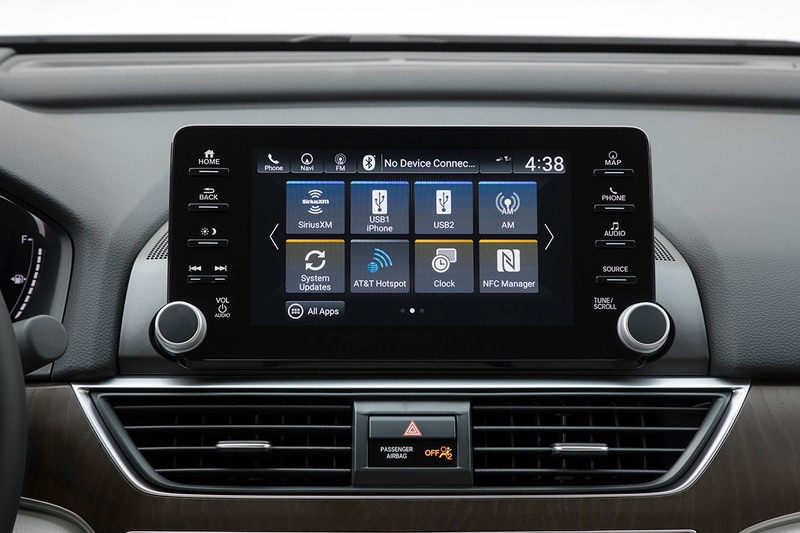 It's certainly more elegant than forcing the designers to try and cram the screen into the dash itself then design around it, which would have forced an awkward blister into the flat dash. Besides, Honda's interpretation is a little less stylized than the versions found in many cars, which try with middling success to blend such tack-on screens into the design; the Accord's version doesn't bother trying to hide what it is, which allows it to fade into the background with ease. After five minutes behind the wheel, the system's location seems perfectly ordinary. The new Accord's seats are comfortable, as you'd expect from a car designed to provide relaxed transportation for people of all ages, shapes, and sizes. My only complaint I had a bear of a time finding a good backrest position using the manual seat adjuster on the Sport model, and that was solely on the passenger's side; there were no such problems in the power-adjustable fun seat, be it in the zoomy Sport's nicely-bolstered fabric/fake leather thrones or the high-end Touring's cushy leather chairs. More importantly for the family buyers it's aimed at, the new Accord is super roomy. There's more than enough space for four big adults to spread out inside; add in the room to be found in the 16.7-square-foot trunk, and it’s hard to see the space advantage of a mid-sized crossover, unless you desperately need a third row. As it has for years, Honda's midsize sedan launches with a choice of two gas engines beneath its hood. Unlike in the past, however, the Accord now offers almost identical trim levels for each of its engines, which is nice—more choice is always appreciated—but it makes choosing that much harder. Basic Accords start off with a version of the same 1.5-liter turbocharged inline four found in the likes of the Civic and CR-V, here pumping out 192 horsepower and an equal number of pound-feet; that engine is available in all five trims—LX, Sport, EX, EX-L, and Touring—in the line. The V-6, however, has been banished from the Accord's engine bay; top-tier versions of the sedan now use a 2.0-liter turbo four-pot that's related to the broadband screamer found in the Civic Type R, detuned down to 252 horsepower and 273 pound-feet of torque. That engine—which comes at a price premium of $2,000–$4,350, depending on trim—isn't available with the lower LX and EX models. As mentioned earlier (and often remarked upon when the 2018 Accord was released), a six-speed manual is available with both motors. However, it's restricted solely to the Sport, no matter how much displacement your Accord's engine has. So, which to choose? For Sport models with stick shifts, the 1.5-liter engine is actually all you need. While it gives up a little pep to the bigger model, having the stick to control it with means it feels every bit as responsive in real-world driving. Thanks to the snails growing from them, both engines serve up maximum torque on a broad platter that starts at just 1,500 rpm, giving them the grunt to hustle around slow-moving traffic with a verve that borders on gleeful. For all those other models stuck with automatics, though, the 2.0-liter is largely worth the extra cash, especially if you’re already going for the fancy Touring model. Not just for the added power—though that's never something to complain about—but also for the 10-speed automatic that comes with it. An all-new, Honda-designed transmission (and the first 10-speed designed for a front-wheel-drive car) with a ratio spread a stunning 68 percent broader than the old six-speed auto, it shifts so smoothly and the gaps between gears are so small, you barely realize it’s shifting when loafing around town. Drop it into Sport Mode, though, and it’ll hold in seventh where it’s just been in tenth, or kick down smartly when you boot the gas. There's a pair of paddles behind the wheel to let you flick through the gears like you're driving a 911 GT2 RS, should you so desire—but with so many cogs to choose from, you're better off leaving the gear choices to the brainiacs who programmed the gearbox. The CVT found in most 1.5-liter models isn’t bad...for a CVT. If you live somewhere relatively flat and only look at your car as a way to get you from here to there, you'll be fine with it; hey, it’s an inoffensive gearbox that gets good mileage. But in the mountains of New Hampshire, it left the smaller engine at a moaned drone while holding it near its power peak to push a ton and a half of Accord uphill at highway speeds. Going downhill, the steering wheel's paddle "shifters" proved worthless unless the car was in Sport Mode; using them to simulate a lower gear and provide engine braking worked for about 10 seconds, at which point it would it default back to drive and the car began picking up speed again. Wouldn't you rather use the one on the left? Admittedly, neither of the powertrains sound less than happy when being worked hard, no matter which transmission winds up connecting wheels to engine. Apart from the noise, though, the 2018 Accord punches above its weight when it comes to the driving experience. Like many Hondas, the new Accord feels more stable, more buttoned-down at speed than other comparable cars. Handling is great, considering it’s not a sport sedan; indeed, the ride/handling balance compares favorably to fancy sedans bearing much deluxe badges that cost far more. It'll lull the folks sitting in the back seat into a blissful sleep on the highway, even over battered pavement—but pitch it down a tightly-wound two-lane, and this Honda comes alive in a manner than reminds you why the brand earned that reputation as the bargain BMW. The Honda is very much in it its element (pun intended) on a back road. So can the new Honda Accord save the sedan? That, of course, will likely matter little to most new car buyers. They'll be more interested in features like the Accord's solid fuel economy (up to 30 miles per gallon city/38 mpg highway on the 1.5-liter, as good as 23 mpg city/34 mpg highway on the 2.0-liter), or the laundry list of technologically-advanced safety features (automatic braking, lane departure warning, active cruise control, and traffic sign recognition are all standard as part of the Honda Sensing suite, and many more are optional), or Honda's generally-stellar reliability. And indeed, many of them will walk straight past the Accord to the CR-V or Pilot, drawn in simply by simple appeals like all-wheel-drive security and an empowering ride height. But for the small chunk of the 300,000-plus people who take home a new Honda Accord over the next year because they examined all the options and found it the best blend of utility, technology, and fun for them...not only are you getting one hell of a fine family sedan, you're also helping to fight for a class of vehicles that represents a far more entertaining alternative than those high-riding rigs that have come to dominate America's roads. Especially if you buy the stick. For sale on eBay, this is probably the nicest Accord of its time that exists outside of a museum. Honda promises equal parts performance and efficiency with their V-6 replacement.